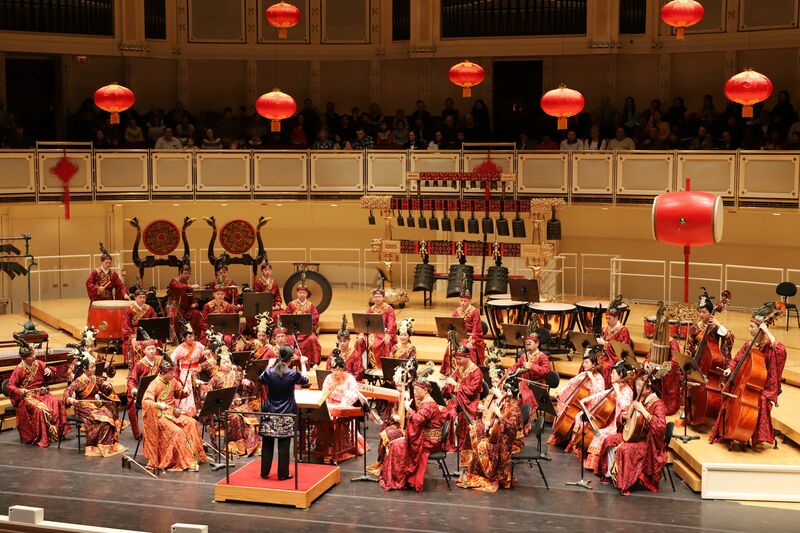 On February 10th, 2019, the grand stage of Chicago Symphony Center’s Orchestra Hall, adorned with hanging Chinese lanterns and traditional decorative knots, glowed resplendently red with the jubilant spirit of the Spring Festival. Here on this very stage commenced the Chicago Symphony Orchestra’s (CSO) 2019 "Happy Chinese New Year" Concert. Chinese Ambassador to the United States Cui Tiankai, Acting Consul General Liu Jun, President Jeff Alexander and lifetime board member Zhao Ling of the CSO, Director David Whitaker of Choose Chicago, and more than 2,000 guests from various circles attended the performance. In his opening speech, Ambassador Cui Tiankai expressed his excitement to be here in Chicago during the Spring Festival enjoying this Chinese New Year concert with everyone. Ambassador Cui extended New Year greetings to the audience, expressed gratitude to the CSO for their continuous efforts in hosting this annual concert, and welcomed the visiting artists of the National Peking Opera Company and Hubei Chime Bells National Chinese Orchestra. He then continued that cultural exchanges are an important foundation of China-US relations. The “Happy Chinese New Year” celebrations during these weeks are conducive to enhancing the friendship and understanding between our people and increasing mutual trust, strengthening cooperation, and promoting the healthy and stable development of bilateral relations. 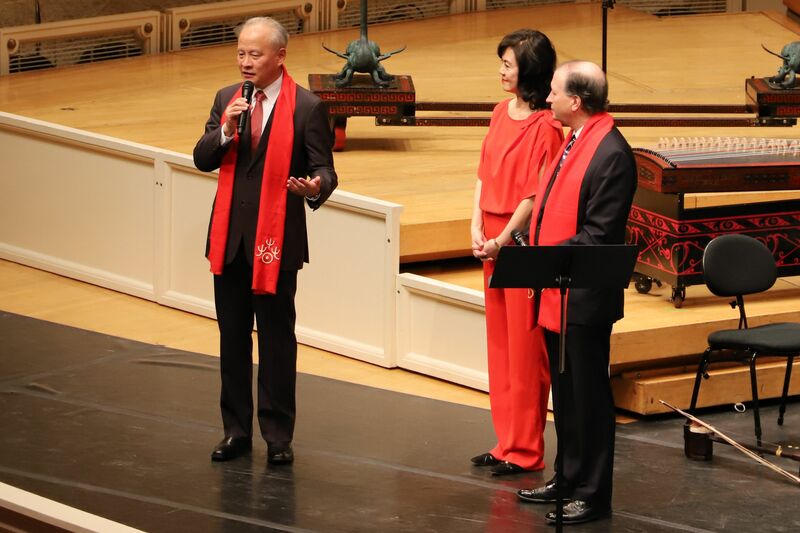 President Alexander and Board Member Zhao Ling stated in their speeches that this year marks the CSO’s fifth consecutive year holding the "Happy Chinese New Year" Concert. 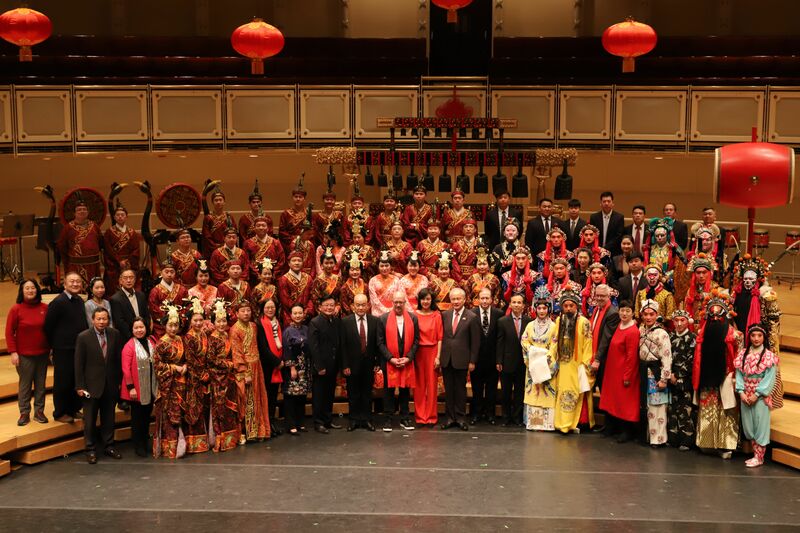 It fills them with great honor to have invited the famous National Peking Opera Company, led by nationally-renowned Peking Opera masters Mr.Yu Kuizhi and Ms.Li Shengsu, as well as the equally famous Hubei Chime Bells National Chinese Orchestra to their stage here in Chicago. They then talked about the CSO’s performance tour in China conducted this past January. To the great joy of music lovers in Beijing and Shanghai, the CSO held four performances in these two cities. President Alexander and Ms.Zhao concluded by saying the CSO is looking forward to actively carrying out more cultural exchanges with China. The concert was divided into two halves. During the first half, the Hubei Chime Bells National Chinese Orchestra performed pieces both from the national orchestral repertoire such as "Blossoms on a Moonlit River in Spring" and "Ge Tian’s Swallow", as well as pieces from the national chime bells repertoire such as "Folk Song of Chu", "Sound of Music" and "Silk Road". The style of chime bells music, one of China’s national cultural heritages, is world-renowned. Dressed in eye-catching traditional clothing, the musicians seemed to set the stage back thousands of years to the time of the Jingchu, dazing the audience with the metallic resonance of chime bells and the unique string-tight sounds of the guzheng, pipa, dulcimer, and other traditional Chinese instruments—it was a genuine feast of the ears and eyes. During the second half of the performance, the artists of the National Peking Opera Company performed for the audience highlights of famous Peking Opera pieces. 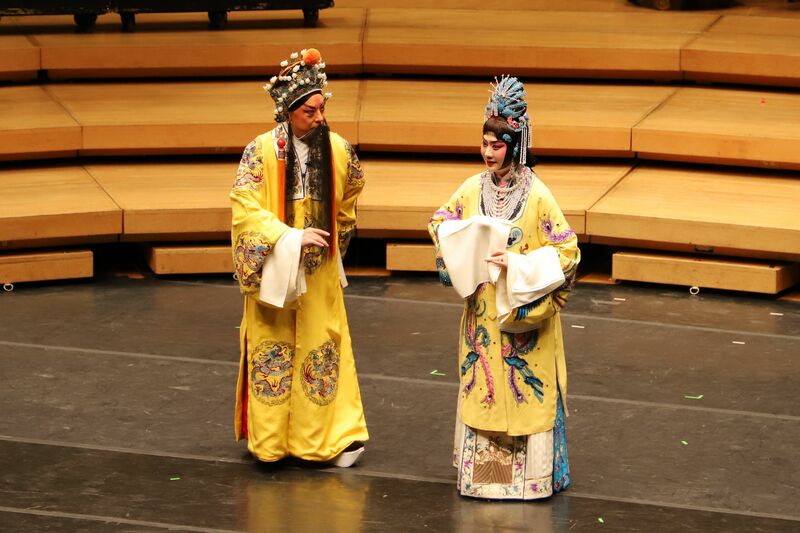 Famous artists Mr. Yu Kuizhi and Ms.Li Shengsu performed an excerpt from "The Palace of Eternal Life", and the audience erupted into resonant applause as soon as they took the stage. Other classic excerpts such as "At the Crossroads" and "Havoc in Heaven" especially showcased the male martial role in Peking Opera, this sitting very well with the audience members who at times were frozen in rapt attention, and at others bursting with the energy of giggling cheer and bright applause. At the end of the performance, the audience gave both ensembles a long and passionate round of applause, well deserved for their excellence of artistry. Afterwards, Ambassador Cui Tiankai, Acting Consul General Liu Jun, the main actors and musicians of both ensembles, and nearly 100 guests from various circles together attended a celebratory reception. 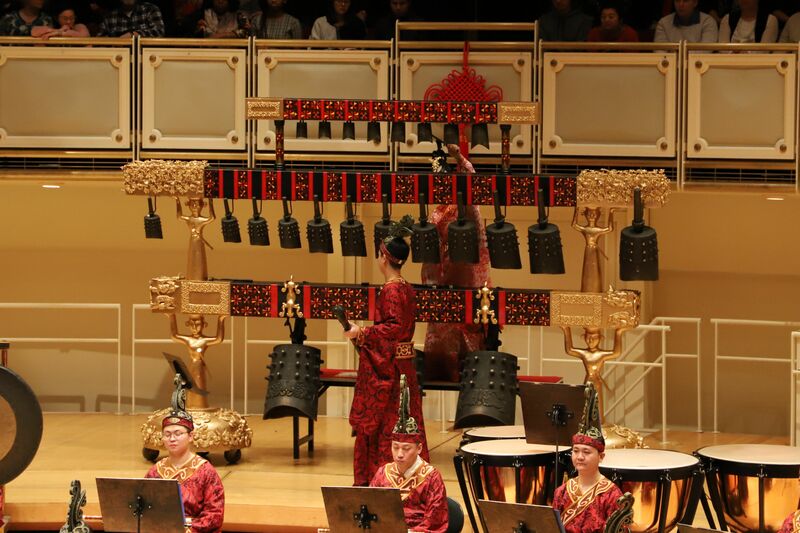 The CSO’s Chinese New Year Concert, now having successfully completed its fifth consecutive year, is always the highlight of Chicago’s “Happy Chinese New Year” event series. 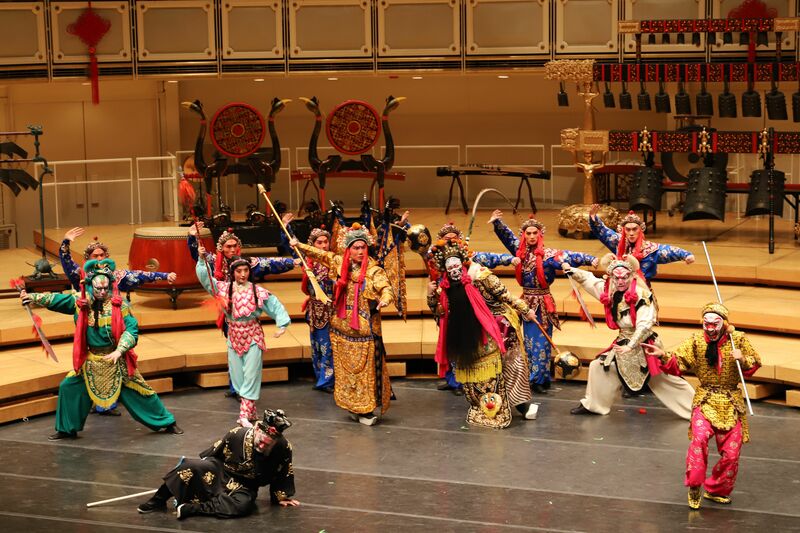 The National Peking Opera Company and the Hubei Chime Bells National Chinese Orchestra will put on respective performances in Detroit and Muscatine, Iowa in the remaining days of the Spring Festival.